I’ve always thought that artificial flowers were tacky. 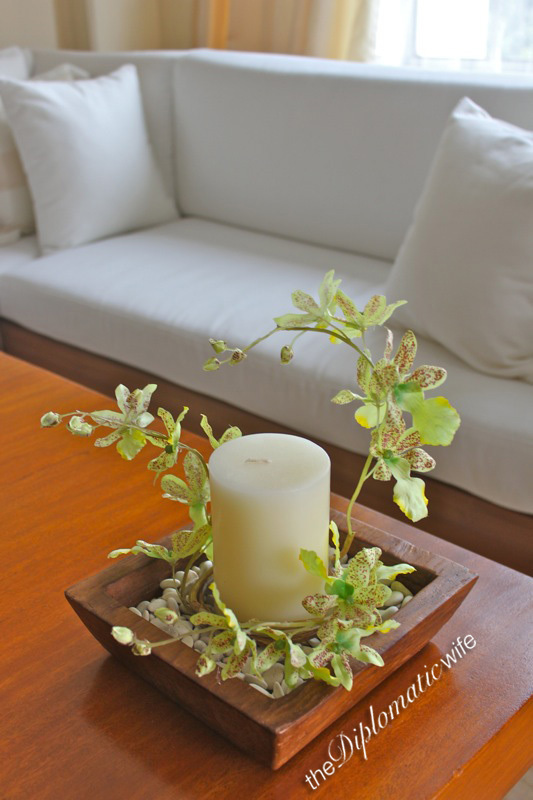 Until I saw the artificial flowers from Vinoti Living in Jakarta. They looked so real, life-like and fresh that I couldn’t help but let go of my aversion to artificial flowers. Even after moving to Berlin, they still retain their beauty and I still get asked by guests if these are real flowers. Use simple yet tall pieces to draw the eye up. Place them on the floor for a simple accent to bare space or put them on top of a sideboard to create the illusion of height in your space. 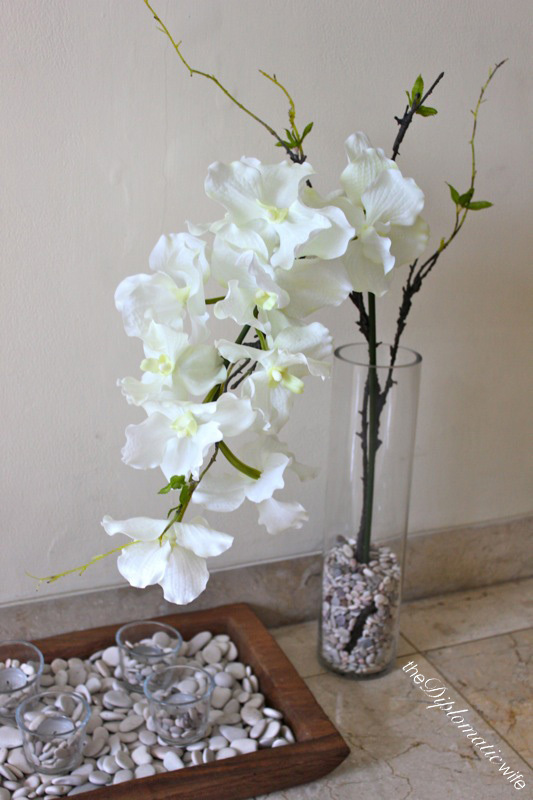 When arranging a tall piece, have a vase that is proportionally tall and use pebbles to position the floral arrangement and to prevent the arrangement from falling over. A bag of pebbles in Vinoti was Rp 18,000 (less discounts) and the 40cm clear glass vase was on sale for Rp 79,500 (inclusive of 50% discount). Remember these metallic Christmas wreaths? 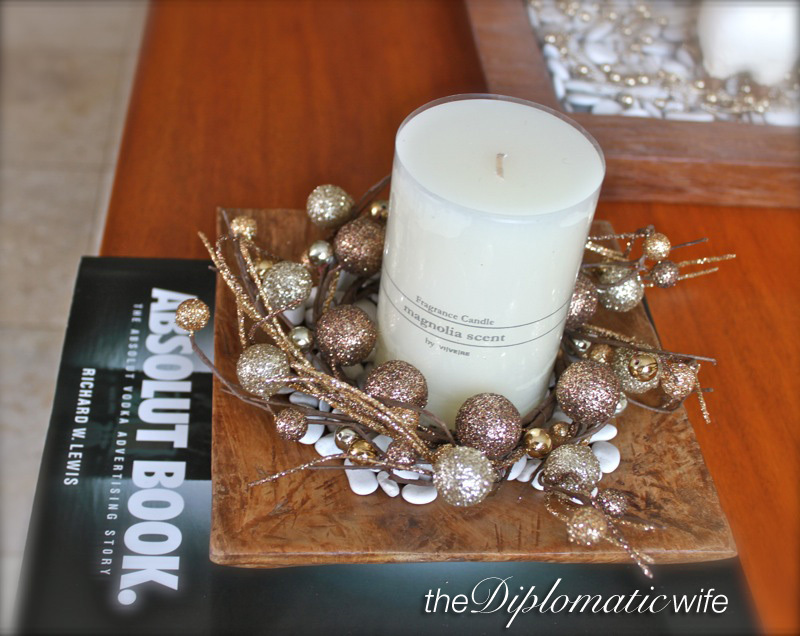 When I took them off after the holidays the candles looked so bare which is why I decided to dress em up. I formed slim orchid stem forms around the base and used green twist ties to hold the position. Before lighting the candle in the evening, remove the floral crown, or lower the flowers to the base so there is no danger of the flowers catching fire. Don’t they look absolutely gorgeous? It’s so funny because when I brought them home my household help thought the were real. These artifical flowers are so realistic that the texture is even the same as real orchids! I absolutely love them! One of the reasons I was against artificial flowers is that I always thought of them as dust magnets. Seeing artificial flowers in Filipino household altars that have collected years of dust made me believe that artificial flowers were impossible to clean. With my artificial flowers from Vinoti, it is as easy as dunking and swirling them in a pail of water. Because of the surface texture, the dust floats away and we hang them to dry. Usually the stores that sell artificial flowers are willing to help you create an arrangement. This was true with Vinoti Living. You can either buy or bring your own vase and pebbles and they will help make your floral arrangement dreams come true! To be honest, I would love to have fresh flowers but in the hot tropics they are expensive and don’t last very long. It feels like I am throwing away money. In Berlin flowers are so affordable so I am enjoying having fresh flowers on our dining table. However my Vinoti flowers are still permanent fixtures around the house. 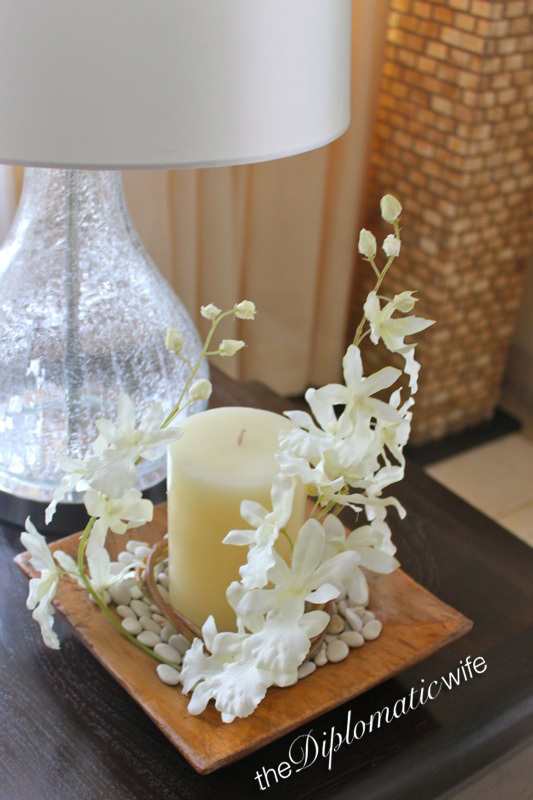 Do you use artificial flowers in your home? I would love to hear where you got them and if you have other tips to add!